Being in York with a couple of hours to spare, there was somewhere else I just had to visit - the National Railway Museum. As it was free I was happy to pop in for a quick look round, knowing that I can come back for more next time I'm in York. My favourite part of the museum was the 'Warehouse', a sort of compromise between display and storage - masses of artefacts, visible and tidily arranged but not really displayed, and with no labels or 'interpretation' material. It was sort of like the best antique shop in the world, but where nothing is for sale. There were some particularly lovely models - and again, I was more drawn to the cutaway carriages than the wonderfully detailed locos - and some gorgeous stained glass windows from glamourous places like Retford. It was nice to go all the way to York to see a destination board for where I grew up. I shall definitely visit again. I describe here my first visit to the Sheffield Tap, and my earlier patronage of the Euston Tap - practically my local in Birkbeck days, whenever I could persuade any of the metropolitan elite to come a-drinking beer with me. But I needed one more to complete the Grand Slam of railway-related beer drinking opportunities. And thanks to someone at the University of York Googling me and thinking I might make a good External Examiner for them, I got the opportunity to plug that Tap gap last week. The York Tap is housed in a former Victorian tea rooms, latterly a model railway museum, from what I can tell. The interior is nice, but not anything like on the scale of wonder that is the Sheffield Tap. On the other hand, the acoustics are better. In many ways, the outside of the building is more interesting, where you can (or could, in a half decent photo) see its wooden construction. The beer is, of course, expensive, but there's a great range, tending towards the foreign and trendy, although I found a pint of Hopcraft's charmingly named We Could Tell You But We'd Have To Kill You brewed with 'secret' English hops that did, joyously, turn out to taste like English hops. Since discovering the Sheffield Tap back in 2013, I have found a few other favourite Sheffield pubs. The Bath Hotel - handy for work - has become probably my first choice, especially for a quick after work drink. It's unpretentious and fairly basic, with a nice thirties interior that's not been gussied up, and a fair choice of beers, albeit heavily skewed towards Thornbridge. No food though. If food is required, particularly after work, then I make my way to the Red Deer, which is popular and knows it, and can get uncomfortably crowded, but does some decent food with a really good and imaginitive range of veggie and vegan choices. Again, there's a good range of beer, including usually a vegan one. Then last week I was introduced to another promising one - the Rutland Arms, down near the station. They have an unforgivably posey website, a somewhat arch menu and a degree of studied eccentricity - but the food was fine, and the range of beers good - and most impressive of all, no sparklers! Not melodeon news - yet - but another, very different box I got for Christmas, courtesy of Jim: an original Volvo collapsible shopping box. Apparently they came as standard with the 260. It's very clever, because you can open half of it, or all of it, and when it's folded, it clips together, and when it's open, you can carry it by the middle handle with one hand. 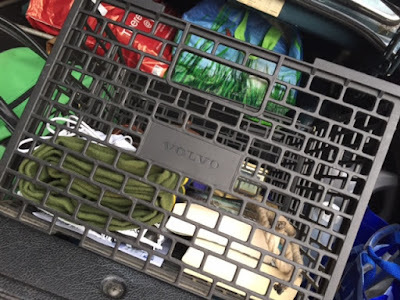 Here it is in the boot of my 240 being used to take stuff to the boat. And here are the new tins, along with the old ones, on the newly refurbished shelf above the table cupboard. There is now a fiddle along the bottom to stop things falling off, and a trim along the top to make it neat and pretty. The Brasso tin contains Brasso. 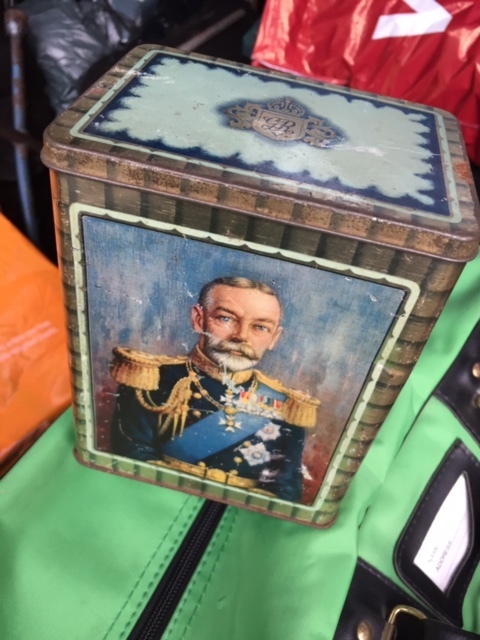 The red tea caddy on the right contains clothes pegs (and once gor dropped in the Chesterfield canal and retrieved with a magnet). The Ambrosia milk tin contains spare mantles and other Tilley lamp accoutrements. The tea caddy in the middle, with the Chinese style design, contains sewing stuff, small nails and picture hooks. There's another milk tin at the back with spare toothpaste and brushes in, and the Brown and Poulsen cornflour tin holds pens and scissors. So nearly all of them are use as well as ornament. Elsewhere, there is a tobacco tin (Lloyds Skipper Brand) with all sorts of things including best old brass screws, ballbearings and Blu-Tack, but I couldn't fit that on the shelf. Whilst in the back cabin at the weekend, I peeled the sticky backed plastic off the newly refitted table cupboard. It had been slightly damaged, but worse, had shrunk away from the edges leaving a dirty sticky border all the way round - a shame, because I liked the fifties effect. It came off very cleanly though, without damaging the paint, and I cleaned round the edges with white spirit. I probably won't replace it as it would only shrink again. I think I still have just about enough left over though to cover the new section of shelf inside the table cupboard. 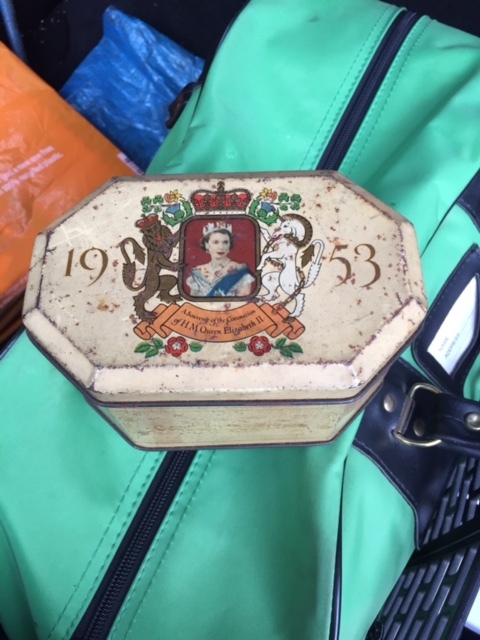 I was browsing last week in the local 'vintage' charity shop, which can be quite expensive, but I found three things for the boat which weren't, very. 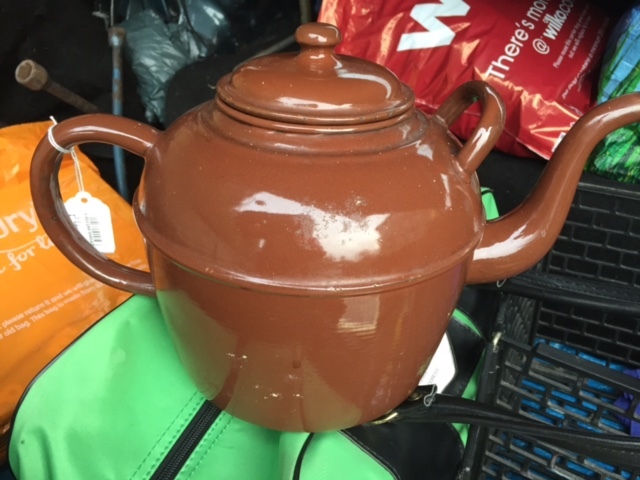 I had to ask myself if I really needed another brown enamel teapot, but I couldn't resist this one - its unusual shape and excellent condition - and only £4 so I had to have it. 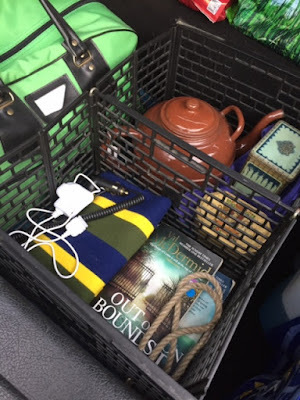 I'd already packed them in the car when I though of taking photos of them, so I snapped them in situ, sitting atop my historic British Waterways holdall. I wasn't going to select my next random destination until after I'd written the very last Saltaire post. However, in was in the pub on Tuesday (the very good Rutland Arms, even if they do have rather a posey website) with a couple of friends, and I was explaining the Big Days Out concept, in the course of which I showed them how I set Random.org to choose a number between 101 and 186 for me. It then would have seemed churlish not to ask one of them to hit the button to determine the next port of call, which I then cross referenced with the Town Class Sticker Album. For each Big Day Out I shall create one final post with links to all the others, which will then be listed in the widget to the right. 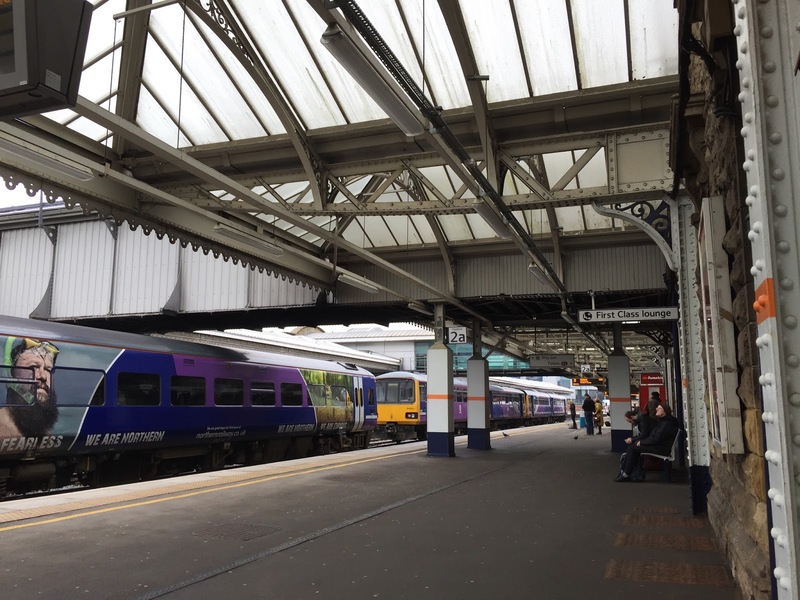 I got a Cross Country service from Sheffield to Leeds, and Northern from there to Saltaire. On the way back I should have caught the train at Shipley, but missed it, so David kindly gave me a lift to Bradford to pick one up there. The outward journey took just over an hour. 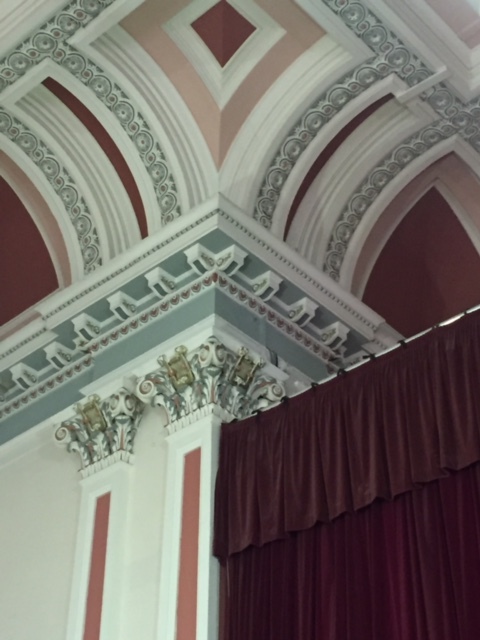 Saltaire's Victoria Hall was opened in 1871 as the Saltaire Institute. Work had begun on building it four years previously, and the cost was £25,000. The outside is stunning, and the interior is beautifully restored and maintained. And so were these people, who started gathering well in advance of the two o'clock advertised 'doors open' time. I have to say that the policy of admitting under-25s for free is unlikely to bankrupt the Cinema Organ Society any time soon. Indeed, they could raise it to fifty with no discernable effect on their revenue. Which is both a shame, and an inexplicable one. I mean, you can understand the cinema organ being more popular with people who remember it from their youth, but for it to have no traction at all not only with teenagers, but even with middle aged people like I must now be... Maybe it's since Radio 2 moved The Organist Entertains (my introduction to the genre) to its 11 pm graveyard slot some years ago. Anyway, back to the Victoria Hall and Nicholas Martin. For the first half I sat three rows back from the front , having first collected my cup of tea and slice of buttered Yorkshire teabread and chatted to a couple of other audience members - one of whom (rightly) confided to me in an awed whisper that I was 'in for a treat.' I also got to eavesdrop on the men behind me talking arcanely (I wrote this down): '...it's wired and winded and on the stop rail...'. I think they might have been talking about the new krumet. One of these same men caught up with me afterwards and showed me photos of the 3/4 size replica Wurlitzer console he'd built in his bedroom. I'm actually not going to try to describe the concert, because it's impossible to convey... but one thought I had towards the end was that this is music to wallow in - not emotionally, but literally, aurally. The choice of tunes hardly matters. A nice touch, that worked really well - and also indicates that the audience was largely made up of cognoscenti - was that there were cameras trained on the organist's hands and feet, displayed on a screen to the right. In the interval I was taken down the back stairs by David and shown the organ chamber with its ranks of pipes and other things I'm afraid I can't even remember the names of (at least, not in relation to the right things). What I do remember is that it costs a thousand pounds a year just keeping it at the right temperature so that stays in tune. I snapped a few hurried photos but they really don't do it justice. David was concerned that I might be being too blasted away by the sound to fully appreciate it from where I was sitting, so for the second half I repaired to the balcony. I must confess that my ears were not sufficiently sensitive or well trained to appreciate the difference, but it was good to have the change of scene and sample the lovely old worn red plush tip-up seats, and look down on the hall. I do apologise for the poor quality snatched photos. The internet can furnish you with many much better ones. This was of course a fabulous way to round off my first Big Day Out - which wasn't quite finished, as I then went and had tea (dinner to those of you still down south) with David who shared fascinating stories from his playing career before dashing off to catch my train back to Sheffield (and missing it, but all was right in the end). Massive thanks to David Lowe for making it such a brilliant day. You probably wondered where I was going with that flight of fancy. Of course I was leading up to the high point of my trip to Saltaire: the organ concert. 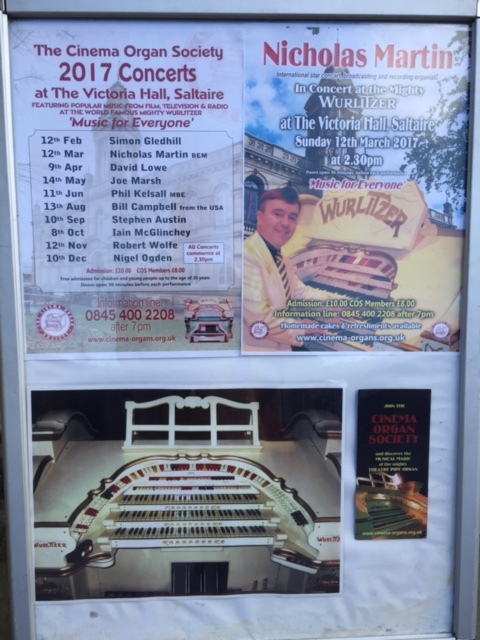 Saltaire's Victoria Hall has, since 2009 been home to the Wurlitzer cinema organ first installed in Oldham's Gaumont cinema in 1937 (that most significant of years) and owned, since the cinema's closure in 1961, by the Cinema Organ Society, who found it a number of different - and more or less successful - foster homes over the years. All the details, and some super photos of it in its original home, are on their website here. The great town hall organs became very orchestrally biased with many imitative stops. Eccentric English organist and organ builder Robert Hope-Jones took the idea further at the turn of the last century with his organs which also had electric action (so the console could be detached from the organ itself), and even more percussions and effects. He also advocated the unit system where one rank of pipes serves many purposes so a smaller number of pipes gives greater versatility. His ideas were not well received in the UK so he emigrated to the USA and after some false starts ended up in partnership with the Wurlitzer company – a well established builder of high quality musical instruments. 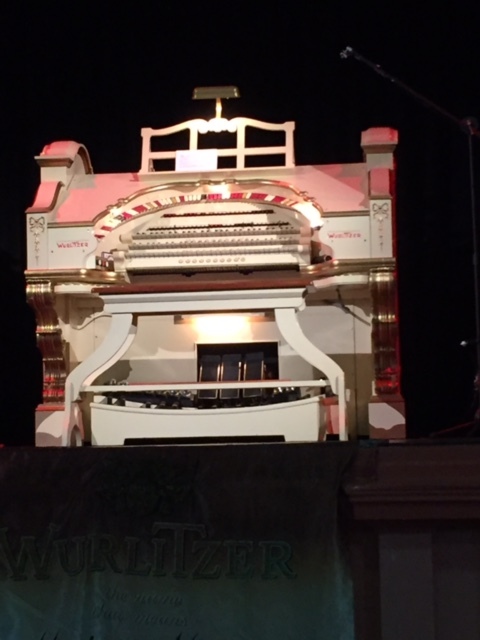 Although intended for ballrooms, skating rinks, bars, hotels, town halls, residences, etc., an early Wurlitzer was installed in an early cinema in Chicago in 1910 and this was so successful that most Wurlitzer organs were installed in cinemas thereafter. Though not designed (as some claim) to accompany silent films the Wurlitzer (and other similar makes) were ideal for the purpose, far better than the church or concert type pipe organs (or harmoniums or automatic instruments, or a pianist; and cheaper than an orchestra). With the coming of talkies only the larger USA cinemas continued using the organs, but in the UK most unit type cinema organs were installed after the coming of talkies (i.e. post 1929), providing interval music, organ interludes etc., though it maybe that some accompanied silent films in the early 30s. Another important use was for radio broadcasting. 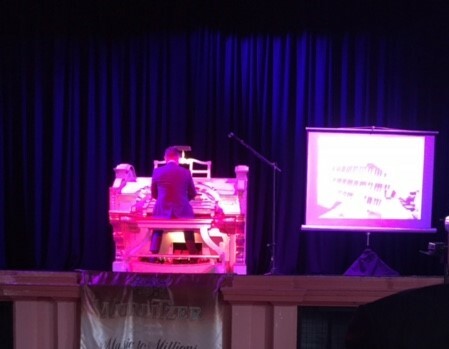 Three Wurlitzer organs were installed in ballrooms in Blackpool (one post-World War 2). Cinema organ use declined for a number of reasons; post 1948 cinema audiences were falling off and many full time organists were dispensed with (but ABC Cinemas carried on with a reduced number), and some continued part time. In the 1960s there was a bit of a revival until removal of organs began in earnest as cinemas closed or were twinned etc. In the USA the revival was prompted by the early 1950 s ‘hi-fi’ stereo LP records by organists such as George Wright, and by the late 1950s and 60s organs were being re-installed in pizza restaurants, public halls and private residences or restored in situ – similar over here but not, regrettably, the restaurants – not sure why. The Blackpool Tower ballroom Wurlitzer carried on but with the massive decline in ballroom dancing (now only for aficionados rather than the general public) its use is very much less and numbers on the dance floor very small. When I was a child, and there wasn't much on the telly, sometimes I would be up early on a Sunday morning, before the rest of the household had stirred, and I would watch the Open University. It was invariably someone demonstrating mathematics and I just loved letting the incomprehensibility of it wash over me. People are passionate about all sorts of different things. Most of those passions I don't share; many I can't even comprehend; some I have an interest in; a curiosity about. But whatever it is you're obsessed with, I get it; I respect it; I admire it. I am passionate about narrow boats (ok, a small subset of them). Other people are passionate about trains, or buses, or the Archers, or Scott Walker - so that I don't have to be (my brain would explode). And I am very, very glad that there are people out there whose passion is cinema organs. Because without them, we wouldn't have any, just as we wouldn't have steam locomotives or big Woolwiches. And they are such extraordinary, marvellous, and almost pointless, things. They don't transport you from A to B; they don't provide clean water; a Mighty Wurlitzer never, ever, carried goods around the country; you can't even take one on holiday. They provide music, for entertainment - just as countless other instruments and electrical and electronic devices can. They do it at great cost, in terms of space, time and money. If they were animals, they would long be extinct. They are complex, massive, delicate, expensive, greedy, scary... and quite fabulous. Here is (are?) the arcana. This 'simple glossary' is, in fact, a failsafe way to recreate that Sunday morning Open University feeling. And - on a serious, and professional, note - brings home just how easy it is to forget that something familiar and easy to you (me), whether that be historic narrow boats or Marxist theory, is a foreign language to the uninitiated. Fortunately for me, I don't have to learn it; I can just revel in it. And that's before we've even heard the organ played. That's just the poetry of the naming of its parts. The steps leading up to the street from Salts Mill, worn by hundreds of feet every day, thousands if not millions over the years. And I very much doubt whether they are the original ones. You know sometimes when you're working a lock, you can't help but be standing in a puddle? As Pete pointed out to me at the AGM, that's not coincidence; that's a hollow in the stome worn by the boots of those who worked the lock before you. And I find that a pretty amazing thought. As a boater, of course I need no excuse to introduce the subject of toilets. It is a subject quite dear to my heart, I must confess, and one that frequently haunts my dreams in quite surreal ways (and that is all I am saying on that subject). Now, I can, hypothetically, conceive of circumstances in which that might not hold true - for example, if there is an axe murderer hiding behind the cubicle door - but as a rule of thumb it has served me well. So I like toilets for their practical value; but I am also very keen on their social history and aesthetics. For example, some old pubs have fabulous Victorian toilets - at least that is what men will tell you. But the ladies' will be sadly disappointing, often a 1960s adjunct - because when the originals were built, ladies didn't go in pubs. So, when I go off on my travels, I am going to see whether I can find any interesting loos to report on. Not quite in Lucinda Lambton's league, but the third and fourth division of conveniences. And I struck quite lucky in Saltaire. Firstly, I visited the toilets in Salts Mill. And when I say firstly, I do mean as soon as I got there. Having been there before, I knew this was a safe bet. The sanitaryware itself was very modern, as befits a recently renovated and repurposed building, but the tiles - or in this case, I think, glazed bricks - were rather good. The basins were very new, but I rather liked them. Look at that fabulous cistern. I think it was porcelain, although it might have been enamel. And that pedastal. And what en excellent flush you would get with the help of all that gravity. I do wonder, in these days of saving water and using it more effectively, why the high level cistern hasn't made a comeback. And so to the Glen Tramway, Shipley's premier visitor attraction (if you don't count Saltaire, which I suspect the residents would prefer to categorise as a separate place); a small thing, with a long history, and, it seems, two competing websites - beware, only the latter is approved by the Trustees! The Tramway was opened in 1895, to carry visitors up the hill to what was then a very popular spot for picnicking and promenading - only the steep ascent deterred people. Initially the fare was 1d each way, but people were inclined(!) 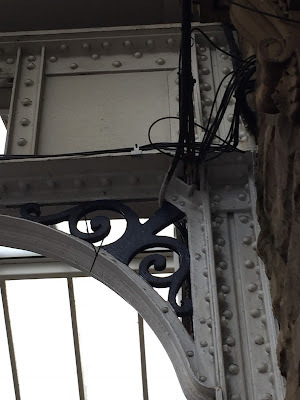 to take the tram up and walk down, which meant the tram cars were unbalanced and this put additional wear on the mechanism, so the downhill fare was reduced to a halfpenny. It doesn't appear to be recorded whether this had the desired effect. The fare is now a very reasonable £1 each way, or £2 for unlimited travel for a day (I think you would get your full entertainment value out of this quite quickly). The tram car is hauled up the hill on a rope made of steel with a hemp core, winding round a drum under the floor of the Top Station, from where the 'driver' controls it. Since an almost nasty accident in 1966 in which someone hurt their ankle, caused by the driver feeling peculiar and stepping out for some air, the controls have been fitted with a dead man's handle, and buffers installed at the bottom, so you can ride with confidence. The motive power was originally provided by a gas engine supplied by John Robson of Shipley. 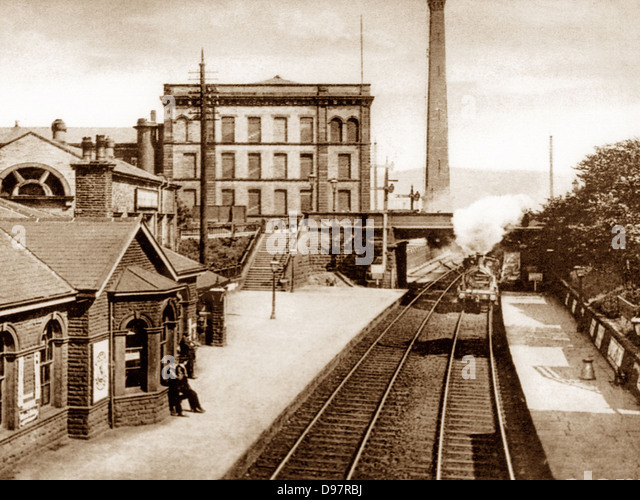 The proprieters of Saltaire would not allow mains town gas to be piped across the park to the tramway, so it had its own gas plant for a number of years. Eventually it was supplied from the gasholder at Saltaire, but in 1915 was converted to run on oil - probably paraffin (hooray! It's a long time since that's had a mention on the blog). This was relatively short-lived, with an electric motor being installed in 1928, lasting for nearly forty years until it was irreparably damaged by vandalism and theft during one of the Tramway's very few and brief periods of disuse in 1967. It now has a new electric motor. I eventually found the Bottom Station after a few fruitless detours through the car parks of Shipley. There's a small 'museum' here - basically a nice little collection of old tins and adverts in a shop setting. Passengers were outnumbered by volunteers when I arrived and I rode up the hill (top photo) almost alone (and I think the other three passengers were all volunteers). Or you can promenade. I had planned to eat my lunch at the top, and so I did, but there was nowhere to sit (I had hoped at least for a bench) so I ate it standing up. Once a decent period had elapsed (about five minutes) I headed back to the station for the down hill journey. Crowds of passengers had suddenly appeared, and on the way back down, the tram was full. In the shop I purchased, for £2, a copy of The Shipley Glen Tramway: Its Social History Since 1895 and its Mechanics by M.J. Leak (a former owner of the Tramway), first published in 2003, from where the information in this post was gleaned. If you're in Saltaire, and especially if you have children to entertain, it can't hurt to go and have a ride. If you're a fan of historic funicular railways, you're probably already a volunteer. According to Wikipedia, nearly forty places in northern Europe have at one time or another been called The Venice of the North. The main qualification for being likened to that unique city seems to be some buildings, and the presence of some water, and English pretenders to the title include Paddington and Birmingham. Saltaire's lions are lovely. There are four of them, although I only photographed two. They are called War, Peace, Determination and Vigilance, and were originally commissioned from the scuptor, Thomas Milnes of London, to go at the base of Nelson's column. Some versions of the story have Milnes's lions being rejected for being too small - and the commision went to Landseer, whose lions were indeed bigger, and bronze - but arguably not as leonine and to my eyes certainly not as characterful. Anyway, it seems that Sir Titus had had his eye on them in Milnes's studio and was more than happy to snap them up for Saltaire. And here is Vigilance, keeping a lookout outside the former Factory School. Did I mention that it was a lovely day? A fairly typical street in Saltaire. Saltaire is, in many ways, an odd place; odd in ways you can't quite put your finger on - and this is one of them. There are no uPVC double glazed windows. Not all the houses have their original windows - I would guess very few; not all the houses have windows in the original style. But there's no plastic. This isn't just because it's a conservation area. Conservation areas are funny things - I recall from when I was on a planning authority, a conservation area made it just as hard to change a seventies replacement back to a Victorian replica as vice versa, which could be quite frustrating. But Saltaire is a very old conservation area. 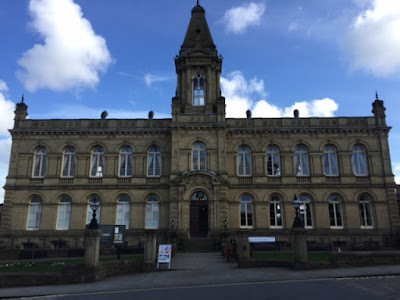 Conservation areas were introduced under the Civic Amenities Act of 1967, and Saltaire was designated one in 1971 (Stamford in Lincolnshire - which is another of the Big Towns on my list - was the first). Whilst it feels as if uPVC windows have always been with us, they didn't in fact gain traction in Britain until the early 1980s. So there were none to be frozen into Saltaire's street scenes. In 2014, the Bradford Telegraph and Argus reported a council crackdown on 'rogue doors', helpfully printing the addresses of the four offenders, presumably so that people could go and give them deprecating looks. I didn't take note of this before I went, otherwise I could have checked and reported back on whether the threats of enforcement action had been carried through. One of them was in Fanny Street. As most of the streets in Saltaire are named after members of Sir Titus' family (including himself), that's not so remarkable (she was one of his daughters), but I bet people seeking a desirable residence in Saltaire would, given the choice, rather live in any one of the other roads. Shallow and puerile it may be, but when I was looking at houses recently, if all other things had been equal I'd have paid a couple of thousand more to live in Industry Street or Freedom Road rather than spend the rest of my life giving my address as Cundy Street (as it turned out I ended up with none of these, which are all roads in the Walkley district of Sheffield). On arriving in Saltaire, I first got my bearings by finding the canal. The trip boat was just leaving, but I decided against paying four quid for the half hour round trip. In fact, the boat had just left as I dithered; I considered following its route on foot, thus getting a better view (all the outside seats were taken) and saving the aforementioned four quid, but in the end I conceded that there wasn't really enough time; it being Sunday there hadn't been a sensibly early train, and I didn't arrive in the village until 11.20. So instead I went straight to Salts Mill, where I had a brief wander around, taking in the toilets (of which more anon) and the antique shop. The National dried milk tim (with 'cotton wool' scratched into its paint) was still there - at £16, not the £12 I'd remembered - but sadly the red cut glass lamp wasn't, or I'd have had it. My next appointment was with the Shipley Glen Tramway, which opened at 12. To find that, I took a stroll through Roberts Park (and a few unintended detours, which are par for the course when I'm navigating). This was originally Saltaire Park, built along with the village for the healthy enjoyment of the workers, but became Roberts Park in 1920, when the Roberts family donated it to the local council in memory of their son Bertram. 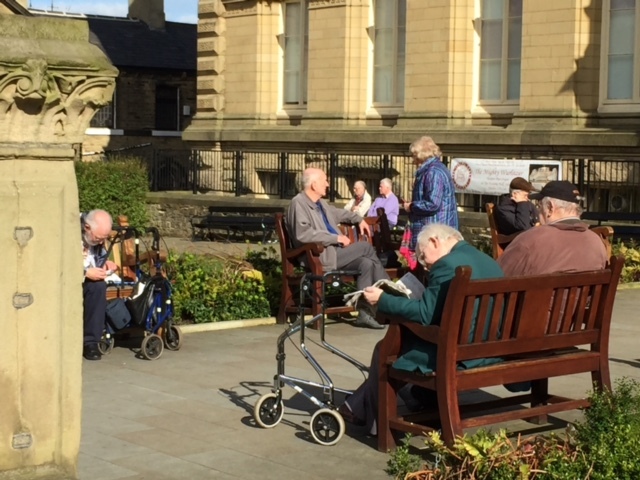 There are twenty rules in all, ensuring that the residents of Saltaire enjoyed themselves in the proper fashion. The original bandstand was long lost, but was replaced with a larger one as part of a four and a half million pound refurbishment in 2009. The statue was provided by Sir James Roberts (the same one who later handed over the park) in 1903, to mark the centenary of Salt's birth. Most pictures of it show his impressively bearded front view, in which he appears to be holding a scroll of paper modestly across his groin, but the sun was behind him, so I had to go for the less orthodox angle. He is surrounded by various sheep, goats, alpacas and other wool-bearing animals from which he made his fortune. On one side the park is bounded by the River Aire, which separates it from the village and the mill. It was certainly a lovely day for it. Usually when I'm on a train I'm not that bothered about having a clear view out of the window; even less which direction I'm facing. Just give me an aisle seat, airline style, and I'm happy; extra legroom and I'm delerious. Normally I'd have my nose in a book for the entire journey. But Sunday was a bit different; I wanted to savour every bit of the trip, including the journey. Unfortunately, I didn't think of that until I'd chosen my seat, which did not have good window access. This was a Cross Country train with the notorious Virgin windows and I was in the worst possible spot for looking out. Nonetheless I craned my neck and did my best. Almost invariably when I leave Sheffield I'm heading south, so this was different from the start; deep, stone-lined cuttings, green and wet, interspersed with tunnels. Over the Don and through Attercliffe; a sea of factories, steel mills and scrap heaps - but how many of them still operating? 'Special Steels Limited: Long Bar Treatment'. Lots of cleared sites too; places in the throes of demolition, and new housing on virtuous brownfield land. Past the sewage works, through a disused station, red brick, five minutes out of Sheffield - what was that? Ten minutes before we reach the suburbs, then green fields; glimpses of canal. Spring sun emerging and the sky turning blue. Change at Leeds and run with the canal now for a way; I'm standing at the doors now looking out like a kid. Flashes of river, a tunnel and we arrive at Saltaire. I didn't come back from Saltaire. I planned to come back from Shipley, but I didn't come back from Shipley either - having gone there for a bite to eat at teatime I managed to miss my train despite a mad dash for the station that got me there moments before it should have left (but with no sign of it in sight) I ended up getting a lift to Bradford Interchange and catching the Leeds train there. I'd never been to Bradford before. 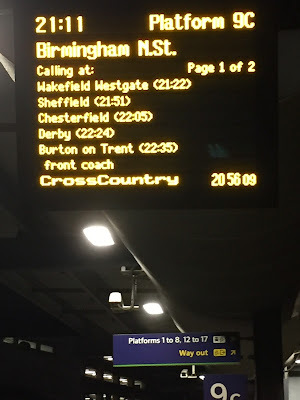 The return fare was £12.50. I suspect this will turn out to be one of the cheapest of my Big Days Out. I love railway stations. * I love the sense they always give me of setting off for somewhere; the potential for adventure. When I worked in Huddersfield, which is ten years ago now, I would get the train to Victoria, and then the tube to Kings Cross. People from all over the world would be milling around, speaking dozens of different languages, both travellers and residents of the most diverse city in the world. But none of that gave me the same thrill as the broad Yorkshire accent of the red-faced guard, straight out of central casting, who was frequently in charge of the GNER train I was catching to Wakefield. It was that voice that told me I was going somewhere; somewhere new and different. I still love to watch the landscape changing from a train window, whether I am travelling north or south, but there is still something about the stations themselves. 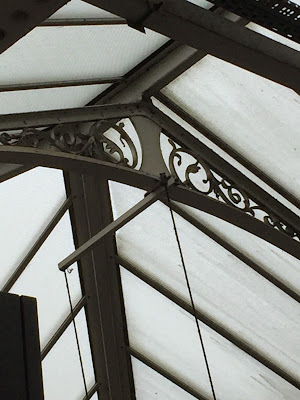 I love the architecture and the engineering, living history in iron and glass. And I'm sure it's wrought iron, too, in this one. I love the prosaic exoticism of the lists of stations that I shall probably never visit, each of them home to hundreds of people I shall never meet. I love the numbers and the patterns, the lists and the things you can remember. I could so easily have been a trainspotter, if someone had introduced me to it at an impressionable age. And I particularly liked this announcement board at Leeds last night, which gave the time of the train at each intermediate station. I hope that's something that will be rolled out more widely. *Except Birmingham New Street, of course.